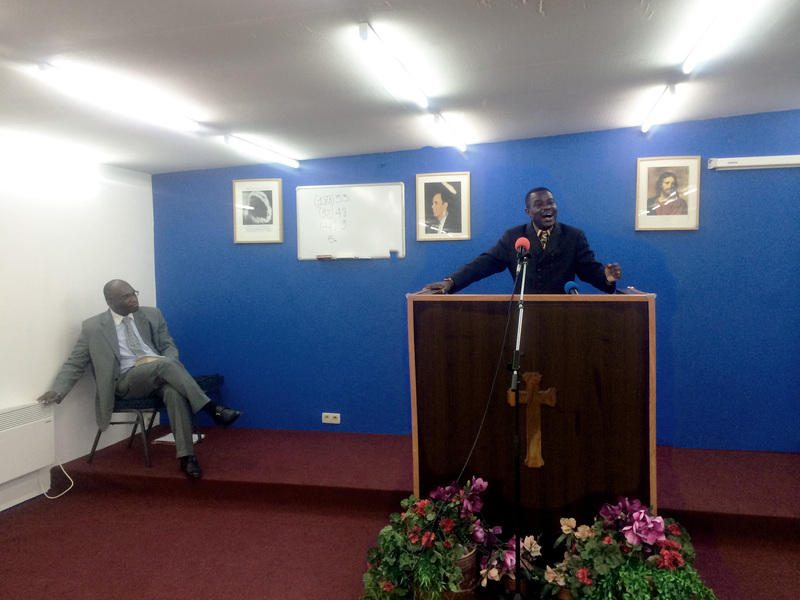 Since Friday, February 14th, 2014, brother Robert NDAYE MULOMBELA, pastor at Roc Seculaire Tabernacle of Paris, went to Liège (Belgium) on the invitation of brother Peniel ISSIYO, pastor at Malachie 4 Lys Tabernacle. at Malachie 4 Lys Tabernacle. Series of special meetings preparing a prayer line for the baptism of the Holy-Ghost will be held there in conformity with the Message of the enditme in order to help God's people to reach the goal for which they have been placed on Earth. For the Holy-Ghost is the Seal of God: indispensable guarantee of the Salvation of the believers. We are glad for the Lord has been willing to count us among the living ones that came across 2013. We are grateful to Him for all His blessings and, by the way, we decided to dedicate ourselves again to Him through a Special Communion Service. This service tookplace on Wednesday, January, 1st, 2014 from 17.00 at Roc Séculaire Tabernacle, 64 avenue du Groupe Manouchian 94400 Vitry-sur-Seine. A video is availble by clicking here. "Modern Events Made Clear By The Prophecy"
The International Convention RST 2011 had been held from 20 to 24 January 2011 on "Modern Events made Clear By The Prophecy" on the occasion of the twelveth anniversary of our church, the Christian Assembly Roc Seculaire Tabernacle. That had been a particular blessing the great amount of participants that came from everywhere. In order to share this treasure with the maximum of people, a Pack of 6 DVDs is already available for 24EUR. For any ordering, please contact us by clicking HERE.